The previous tern blog post mentioned that after a late start, the first egg was found on 27th May. It took a few more days for momentum to pick up but from the 5th June onwards the colony seemed to get into the swing of things and multiple new nests were found each day for the next week or so with 60-80 birds present on most days. Amongst this flurry of new nesting we also encountered a small number of losses. Four nests (K1, K3, K8 & K20) abandoned within a few days of laying their first eggs. Reasons for this remain unclear but in previous years we have attributed predation of adult terns by Peregrines & long spells of rough/wet weather as potential causes of nest abandonment. Another theory is that some pairs may involve first time breeders, which might not have the hang of what they are meant to be doing! Nest K23 decided to lay its eggs way out beyond the fencing, far too close to the shoreline and before long it was washed away by a high tide with a backing wind. Again, most likely an inexperienced pair which will hopefully lay a replacement clutch this week further up the beach. Another nest which was lost (K7), had 1 egg predated by an as of yet unknown small mammal. Small shards of egg shell & spilled yolk were all that was left in the nest scrape, which on previous years experience would tie in with those signs known to be left after Hedgehogs had made it into the colony. We performed a thorough check of the sand dunes in the immediate area but found no signs of tracks or droppings. All the tern, Ringed Plover & Oystercatcher nests surrounding K7 have remained active since with no egg loss so we are hopeful that this was an isolated event. So after losses have been taken into account, the total number of active pairs as of this evening stands at 28 nests with 57 eggs. This is certainly much lower than what has come to be expected for this stage of the season over the past decade when 50+ pairs could be established. We think this is due to a combination of the late Spring/breeding season being experienced by many species this year and also as a result of the high tides & storms which led to no successful breeding in 2012. Perhaps many of the regular Kilcoole breeders have opted to try somewhere else this year? 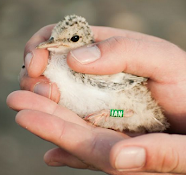 Switching colony sites in response to factors such as vulnerability to tides, increased disturbance by people or the presence of certain predators is normal behaviour for terns. Little Terns in particular are known to move location within the same season if the initial area they chose doesn't suit. At the same time they are also known to return the next year if all seems ok. As such we aren't too worried by the fact that there are (relatively) low numbers of breeding birds present this year. In fact, we're delighted there's some back at all! With that in mind, we'll be doing our utmost to ensure that those birds which have graced us with their presence this year will be pampered, guarded 24/7 & treated to the full VIP wardening package!